Well, it may be another year but it’s business as usual and things show no signs of slowing down in leisure recruitment. While everyone else has been shredding those extra layers from Christmas, we’ve been scouring the leisure sector for jobs, candidates, and gossip. Here’s a selection of the stories that have caught our collective eye so far this year. Virgin Active is starting 2015 looking to sell itself on the stock exchange, and they have chosen South Africa as their location rather than London. This reflects the impact that Virgin Active has had on the African continent, and will be third Virgin venture to be floated in a matter of months. We wish Sir Richard Branson and his team every success. In an interview with Health Club Magazine, Pure Gym’s Jacques de Bruin predicts that competition in the low cost gym sector will only intensify over the next couple of years. The next two years will see budget gyms establishing their position in the market, and will inevitably mean some operators being lost altogether from the low cost sector, and others concentrating on their more profitable gyms. Interesting story for those operating in the budget fitness sector. In a Sky News report, a study has suggested that shortages of good people and an upturn in job vacancies were pushing up salaries, particularly for temporary staff. While 2015 is being feted as the year of the employee, a general election only weeks away may turn everything on its head again. We will be watching with interest. There’s been a fair bit of moving and shaking at The Bannatyne Group recently, amongst the news of their Director of Finance having been arrested for fraud. The promotion of Justin Musgrove from Commercial Director to MD builds on his experience, which includes 19 years at Center Parcs running their Aqua Sana spas. Great hire for Bannatyne, and we wish Justin all the best in his new role. Whether you agree with the producers for dropping an actress who supposedly lied about her age or not, here’s another reason why, when it comes to a new job, honesty is the best policy. As they hired her in the first place, you could argue she was convincing enough to play the role of a younger teenager, but lying to the producers has landed her in hot water and now the role is being re-cast, possibly with an actual 14-year old. Who knows? We loved this story about a job advertised for a paintball tester. It basically involves being shot at with batches of paintballs in the name of keeping paying punters safe. Sounds about as desirable as being a food taster for an unpopular monarch, but with a £40k salary on offer, it’s no surprise they had around 10,000 applications. They are looking for someone with ‘a high pain threshold’. No kidding! And did you see our own news? We have been rated as one of the top recruitment agencies on social media, which is fantastic. What news articles have caught your eye so far this year? This week we made our debut into the #ARP100 at number 69! 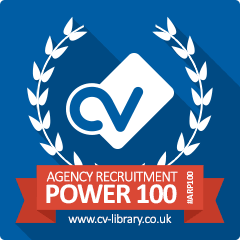 The #ARP100 is a league table for UK recruitment agencies on social media. It is ranked by Klout score which includes our main Twitter account and our main Facebook page. This does not include the influence on our more specialist accounts, or our LinkedIn presence as yet, but Klout are working on it! To be measured as one of the most influential recruiters on social media is amazing! We do work hard on social media as we know it’s a brilliant resource in reaching out to both candidates and clients. With more and more people on social media, and more people using it as a job-hunting resource, we invest resources in keeping in touch through various social media channels, including Twitter, Facebook, LinkedIn, and Google+ as a company. This is on top of the sterling work done at a more personal level by our individual recruitment executives, and is a mere supplement to the tried-and-trusted recruitment methods we use, and will continue to use, on a daily basis. So as of today (13th January) we are in position 69 with a Klout score of 46 which isn’t too shabby. We may not stay this way. With more and more recruiters signing up to #ARP100 we are bound to see some movement in position, although I’m confident our influence, as measured by Klout, will only improve. For now, 69 is our new favourite number. Please come and follow us on Twitter, Facebook, and LinkedIn. Be warned – you may be heavily influenced in a social way!